WhatsApp users had to find another way to communicate with their friends and loved ones on Friday morning after reports of an outage in countries across the world. Due to an unknown issue affecting the smartphone app, users were seeing the clock symbol after attempting to send a message, meaning that the message hadn't been sent to WhatsApp's servers. The website for the messaging app also appeared to be down in what may be a domino effect.The outage may be an embarrassment for WhatsApp's parent, Facebook, which has this week announced record revenues from advertising.Facebook declined to comment to Sky News when contacted. 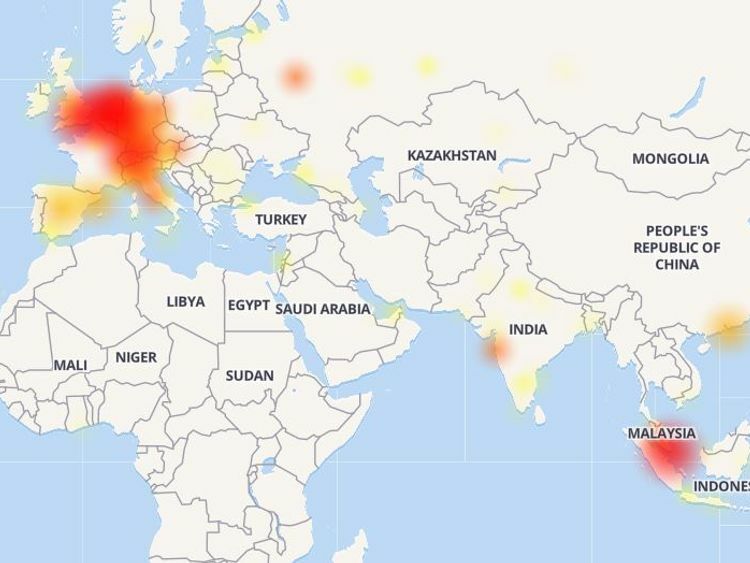 The Down Detector website's heat map showed reports were especially common in Europe, although complaints on social media came from people located worldwide.Without their beloved messaging app, many of the 1.3 billion monthly users took to social media to joke about the outage. Twitter user @AdOketch said: "Many people have died due to #whatsappdown because they can't forward the chain message to their 10 friends! "Others called for two minutes' silence for those who reinstalled the app in an attempt to get it working again.Issues were noted in Europe, India, Malaysia and Russia.WhatsApp did not give Sky News a statement regarding the cause of the incident, which lasted close to an hour.A company spokesperson said: "Earlier today, WhatsApp users globally had trouble accessing the app for about an hour. This issue has been fixed and we apologise for the inconvenience. "They added: "This was not the result of a cyberattack."